Rapid Handover provides real-time shift data. The app captures and prioritizes a list of all completed and open tasks from the previous shift. It enables incoming shift leads not only a more seamless handoff, but the tools and resources to make better, more informed decisions. Rapid Handover’s predictive analytics flag risk factors such as crew absences and reported equipment issues. Foremen are better able to see these potential issues for productivity and can address them proactively. 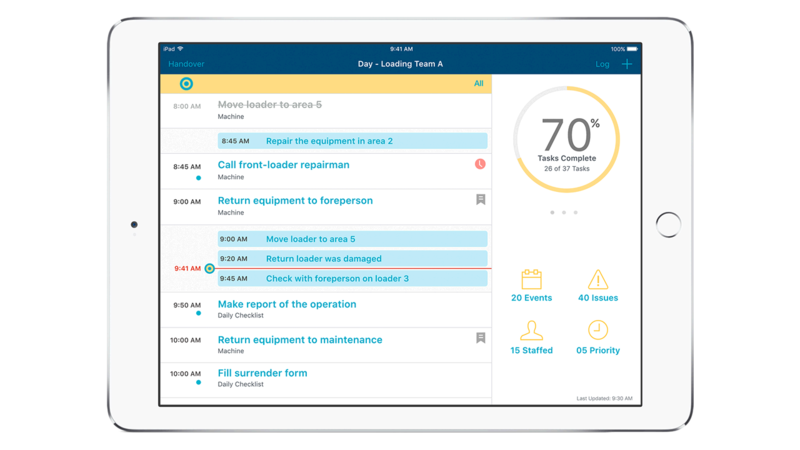 The app’s intuitive dashboard combines tasks, events and safety information to enable better decision making in the field and across shifts. Foremen can easily take photos with a built-in camera to document issues with broken equipment. They can use dictation to capture notes to share with incoming foremen. Foremen are now able to execute quick and thorough handovers using information and analytics – enabling increased productivity and enhanced worker safety. Shift supervisors can use the gathered information to perform audits and reviews.